Today, homes can contain not only master bathrooms but also kid ones for your children to share daily to perform various grooming tasks. Instead of designing these bathrooms in an adult manner, you should create ones that take your young ones into consideration. 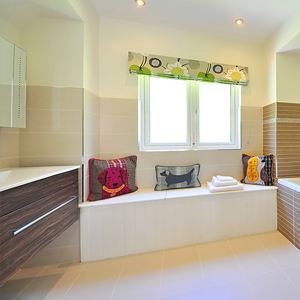 You can include bright, playful colours and special features to make the bathrooms more kid-oriented. Read about further information on these ideas for bathroom designs for kids in the following list. Paint the walls of your children’s bathroom with bright, playful colours such as azure blue, lime green, hot pink or brilliant yellow. You can have a single colour or combine several to enhance the walls in a kid-themed way. On top of this, add appliqués of fish, zoo animals or other characters that appeal to your children. Customise one of the bathroom cabinets to include a built-in step stool below the sink. If you have a freestanding sink, place a regular kid-safe step stool at it to help your children reach the sink easily. You can install towel hooks or racks that have characters on them such as giraffes or other animals. This feature will encourage children to hang up their towels once they finish drying their bodies. In addition, it enhances the room with another enjoyable design element. Another feature that is ideal for bathrooms for children is the installation of a kid-size toilet. A toilet of this size is easier for a child to use than a standard adult toilet is, especially during the early years of a child’s life. Splashbacks around the tub ensure that you protect the walls from children splashing water as they bathe. Tile or fibreglass ones are popular for bathrooms since they are durable and easy to clean. With all kid bathrooms, it is important to install a slip-resistant flooring to ensure that your young ones do not fall and harm themselves as they walk on it with wet feet. A number of different options exist today, including sheet vinyl or certain styles of ceramic tiles. To explore additional details about the above ideal bathroom designs for kids or other ones, contact Concept Bathrooms & Construction. We are experts in designing and installing bathrooms for both kids and adults along with providing any custom joinery that your project calls for to ensure satisfactory results.